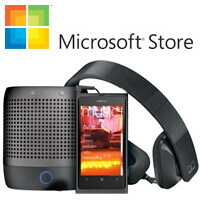 Those of you who have ever browsed the Windows Phone section at the Microsoft online store might have seen that Nokia Lumia 800 bundle. Basically, you get a Bluetooth headset, a wireless speaker, and a set of fancy stereo earphones alongside an unlocked Lumia 800 in either black or magenta. And you know what, the bundle has just recently been treated to a price drop, so all these goodies can now be purchased together for $599. Your $599 buys you a Nokia Lumia 800 that gets along well with AT&T's 3G bands, but can be used on any GSM carrier, a Nokia Luna Bluetooth headset, which stands out with its futuristic design, a Nokia Play 360° wireless speaker, to which you can stream music straight from your handset, and the Nokia Purity HD stereo headphones by Monster. Purchasing these accessories separately would set you back some $430, meaning that the deal is actually worth considering, in case the Lumia 800 suits your fancy. For those who need a refresher, the Nokia Lumia 800 has a 3.7-inch ClearBlack display with a resolution of 480 by 800 pixels. The single-core processor inside it runs at 1.4GHz, and the camera on its back is of 8 megapixels and sports Carl Zeiss optics. It won't be updated to Windows Phone 8, however, which is a bummer. Instead, it will most likely get the Windows Phone 7.8 update later this year, which includes some WP8 features. Is anyone interested in this Nokia Lumia 800 bundle now that its price has been reduced? Let us know by dropping a comment below. Guess is just me, but those are some ugly headphone, well at least the one pictured. It's BS that they won't just sell the phone without the extra crap. A real shame!